Traveling with our best friend at our side enhances any trip. Seen through your dog’s eyes, every falling leaf and blade of grass is a cause for celebration. Getting to your destination can be stressful, but keeping your dog safe and happy doesn’t have to be. I am excited about the Mobile Pet Carrier from Richell USA. Quality construction and safety features mean you can concentrate on the adventures you will have when you arrive instead of worrying about the journey. The Mobile Pet Carrier meets or exceeds most airline safety standards (IATA). The special latches on the door and the double handles on top provide stability and allow for smooth lifting, which is a must for air travel. Skip the extra cart at the airport because the Mobile Pet Carrier rolls easily on sturdy, built-in wheel casters, just like a carry-on suitcase. In the car, pull the seat belt through the handles for safety on the road. It is easy to forget something when packing for you and your pet, so make a list ahead of time. Certain vaccinations may be advisable since risks vary with geographic areas. 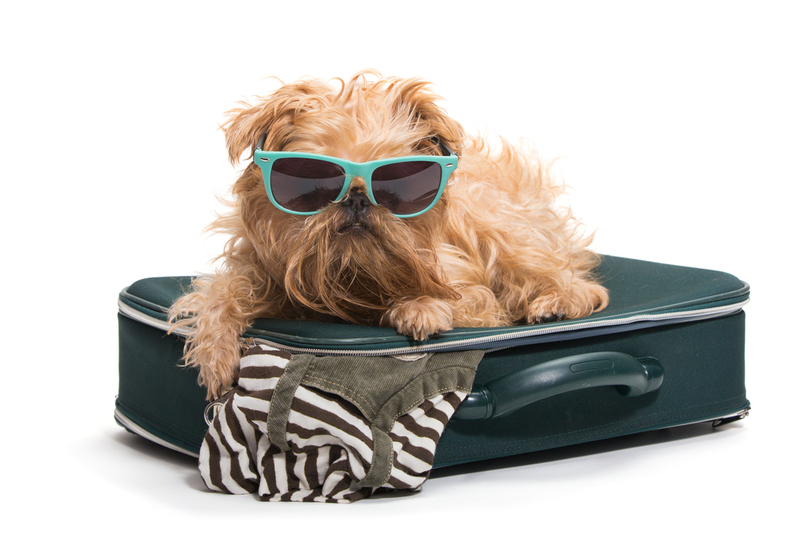 Check with your airline for their requirements and always travel with the pet’s vaccination records. Identification tags are a must. Even well-behaved dogs can get lost in new areas so keep your dog leashed on the trail or in town. NOTE: I strongly suggest that you get in contact with your airline(s) to ensure that the size and specifications meet their requirements. At home, dogs like to relax in a favorite spot, preferably with a roof over their heads. This is why you may find your dog under a table or desk where they can take power naps but still keep an eye on you. The gorgeous, new Wooden End Table Crate from Richell USA fills their need to nest and functions as designer-quality furniture. The table top and all four sides are beautifully lacquer-finished and stain resistant. Your pet can see out easily even when lying down because the wooden rods in the door go all the way down. The door can be clipped open to allow the pet to come and go as he pleases. 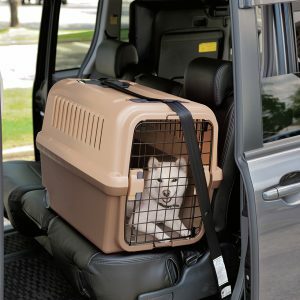 To transition your dog into his new luxury crate, clip the door open for a few days. Toss in treats and put a flat, comfy mat inside. Hide a new bone or toy inside while your dog is not looking. Then allow him access and use a phrase like, “Go to your place!” as your dog investigates, so he sees the crate as a treasure trove of fun finds. Once he walks in and out on his own, you can close the door for brief periods. Always remove his collars and provide a healthy chew toy to keep him content. The future of pet containment has arrived and is ready to take its place in the heart of your home. Pet owners increasingly demand function, style and durability in their pet products. 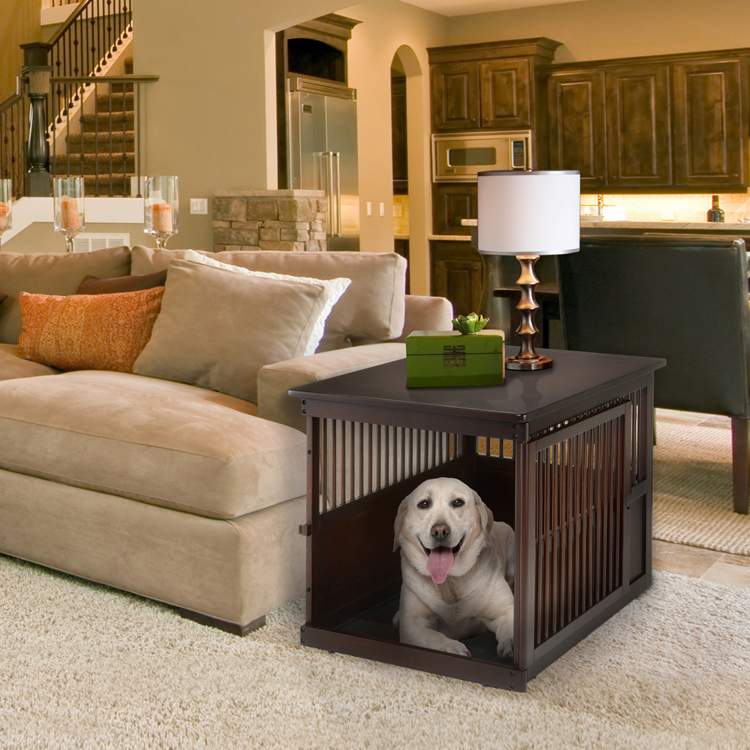 The Mobile Pet Crate and the Wooden End Table Crate from Richell USA pass the test with flying colors. For more helpful pet tips, products, and information, visit our blog.